Resort fee yet not even complimentary coffee or water in your room. Great place to stay. We will visit again :) Very clean and staff was efficient. Nice atmosphere and very fun. Pool area was my favorite! Loved the pool area. The staff was kind and the everything was kept up nicely. Fantastic pool area. Staff across the board helpful and friendly. I liked the location of the property. I wasn't happy with the room. The workers were very friendly. The food at the buffet was good. The Michael Jackson show was ok. It is more for teenagers. In general, is was a beautiful experience. Long walk with luggage from lobby to Delano rooms very clean and staff very friendly. Frankly the service staff was quite good with notable exception of cooks and kitchen staff who were rude and dismissive. Rooms were amazing and the property as a whole was great. 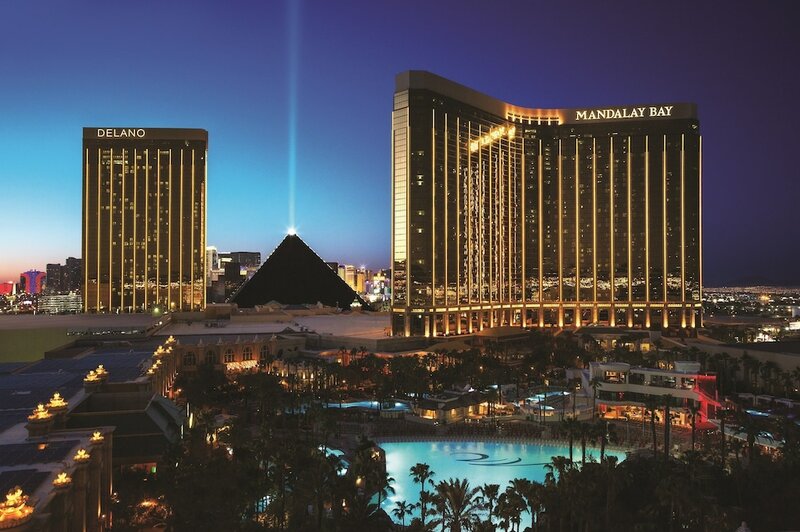 Located in Las Vegas Strip within a short walk of Bali Hai Golf Club, Mandalay Bay Resort And Casino is within a mile (2 km) of other popular sights such as Park Theater. This 3209-room, 4-star hotel welcomes business and leisure travelers with 3 outdoor pools, a full-service spa, and a casino. Enjoy dining at Aureole, one of 20 onsite restaurants. Savor a meal from the comfort of your room with 24-hour room service, or get a quick energy boost at the 4 coffee shops/cafés. For your convenience, a continental breakfast is served for a fee each morning from 7:00 AM to noon. A flat-screen TV comes with cable channels and pay movies, and guests can stay connected with WiFi. The bathroom offers a soaking tub, hair dryers, and designer toiletries. Other standard amenities include a minibar, a safe, and a phone. Mandalay Bay Resort And Casino features a full-service spa, 3 outdoor pools, and a casino. Parking is available for USD 15 per day (USD 24 per day for valet parking), and there's also limo/town car service. The 24-hour front desk has multilingual staff ready to assist with tours or tickets, luggage storage, and dry cleaning/laundry. Other amenities at this spa hotel include a nightclub, a lazy river, and a fitness center. Thank you for your positive review of Mandalay Bay Resort and Casino. We h ope you consider joining us again when your travels bring you back to town. Join us again at Red Square-our Russian cuisine with a twist! We look forward to your next visit! Continental breakfast is served daily from 7:00 AM to noon for a fee. Aureole - Restaurant open daily for dinner. Seabreeze Cafe - Cafe. Open daily. The hotel has 3 outdoor swimming pools and a seasonal outdoor pool. A lazy river, a spa tub, a sauna, and a fitness center are other recreation options. Guests under 18 years old are not allowed in the fitness facility.